The disks make a groove in the soil and the seeds drop out of the long bin at the top, down a seed tube, and into the soil. Fertilizer can also be applied with the seeds. This lets seeds be sown in continuous rows, all at the same depth and all covered by the same amount of soil. It replaced broadcast seeding in the 1880s. By the 1930s gasoline powered tractors became common. Prior to 1850, seeds for hay and grain would be sown by hand by being thrown out of the sack. The next innovation was the "knapsack" broadcast seeders. By the 1880s Wagon mounted broadcast seeders were available. After the seeds were broadcast, a harrow would be run over the seeds to stir the dirt around them. Unfortunately, many seeds were covered too much or too little with soil. This was replaced by the grain drill as it could plant the seeds at the proper depth and ensure proper covering with soil. The first grain drill was patented in 1841. It became common in the Midwest in the 1860's and California in the late 1880's. Its development followed the mechanical reaper which allowed a far larger acreage to be harvested. It was replaced in the 1930's by newer equipment which could handle the faster speeds of a tractor. The spring loaded double-disk furrow-opener is composed for two rather flat disks set at an angle to throw soil in both directions creating the groove for the seeds. It does not penetrate as deeply as a single disk. The double wheels are best for very loose dry soil. Fertilizer can also be applied with seeds. The seeds are agitated in the seed box to fill the seed reservoirs beneath the box. Serrated wheels propel the seeds at a set rate to toward the seed tubes. An adjustable partition controls what percent of the agitated seeds fall into the seed tube par rotation of the wheel. In this the number of seeds planted per distance was adjusted. All power is taken from the axel as can be seen by the sprockets attached to the axel. 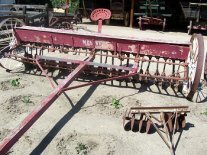 On each axel are 3 sprockets: the outward one drives the seed agitator, the middle one is a clutch for connecting the seed feeding gears, and the one nearest the center drives the serrated seed feeding wheels. The chain to the agitator is still present in the far right sprocket in front and below the seed box. Some rubber tubes are still present which carry the seeds to the space opened up by the disks. A shot length of chain (still present on the far left disk) is attached to the back of the disk housing to cover the seeds. Small scrapers are seen on the sides of the sides of the disks to keep mud from sticking. The space between the disks is adjusted by a spacer that can be raises or lowered. The entire disk assemble could be raised off the ground by handles on either side of the drive, which are no longer present. These also controlled the depth of the seed planting. Raising the disks also disconnected the seed feeding sprockets from the axel to stop the seeds from falling. The disconnecting mechanism is seen half way between the axels on both sides. The Moline Plow Co., of Moline Ill started in 1866. Upon acquiring the Minneapolis-based Monitor Drill Co. it entered the grain drill business. By 1909 it was a major manufacturer of grain drills until the 1929 merger forming Minneapolis-Moline: the latter continued building drills until merging some years later into White Farm Equipment.